Summer is fun especially when you throw a little party every now and then. Just to celebrate the sun, the warm nights and your friends. Lately I’ve been trying different recipes for summer cocktails. Light and fruity is the key. 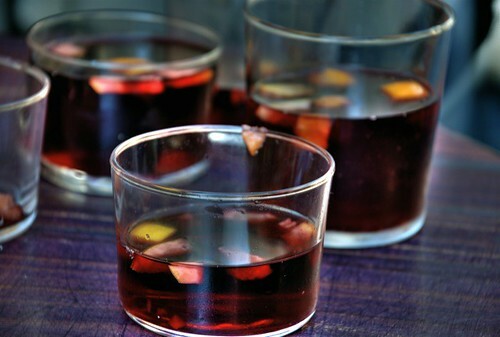 This sangria recipe, learnt from a Spanish student, is my go to summer drink for when I have people over. It’s a very easy recipe to remember, once you know the ratio, you’re good to go. The secret is to have 4 parts wine, 2 parts orange juice and ½ part alcohol. This way you can make from a bottle of wine of 1 liter, ½ orange juice and 100ml of vodka a mini-sangria to try. Or you can go huge and make one for a party of 10 to 15 with 6 liters of wine, 3 liters of juice and 400 ml of vodka. You mix the wine, the juice and the alcohol. Then you add the fruits chopped into bite-sized cubes and you have to leave it in the fridge for at least 3 hours. This is a must for the recipe, cool makes the fruits absorb the alcohol and mixes the tastes better. Spanish wine is very sweet and doesn’t have tannin, which gives wine its sour taste. That’s why you have to pick the sweetest wine you can find, if you don’t want to add any sugar. If you have to manage with a dry one, you can add sugar, brown sugar or honey to taste. Also, wine changes it’s taste, a big batch of sangria lasts only a couple of days. The orange juice can be all natural but it cannot have pulp. So you can go cheap and buy your favorite fizzy orange drink or you can go exquisite and squeeze oranges ‘til you drop. Vodka is the perfect alcohol for this cocktail because it has no taste on its own. It’s meant to be absorbed in the fruits. Gin is also an alternative. The fruits cannot be soft fruits, They will get mushy and disintegrate in your drink. It will not look pretty, but it will still be tasteful. Drink your sangria with a straw if you really want to have a fun night. But be careful, the sweetness is fooling, you will not be aware of the euphoric effect of the alcohol. When you become aware, just drink water if you don’t want to go overboard. Put your party hats on and make some sangria!